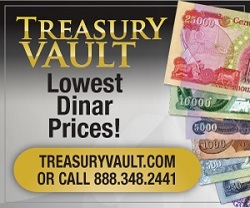 Banking offices and currency markets in Iraq has seen a remarkable increase the price of the US dollar against the Iraqi dinar today. Per dollar and reached 1250 dinars [125 000 dinars for one hundred dollars. The price of $ 100 reached today, the markets in the Kurdistan region, 124 000 dinars.